If you have a Maryland driver’s license, you’re one of 4,264,875 licensed drivers in your state, as of 2016. Although we hope these millions of drivers feel confident in their car insurance coverage, that’s probably not the case. That’s why it’s important to stay informed with the right sources. Hint: We’re one of them! Before you spend too much money on Maryland car insurance, it’s wise to understand more about what you need to pay for and why. When searching for the right insurance company for you, compare car insurance quotes right here. Are you tired of spending too much money on car insurance in the Old Line State? Are you fed up with hours upon hours of researching insurance information? Comparing various resources can get overwhelming, confusing, and exhausting. So that’s why we’re here to help! We aren’t trying to sell you anything. We’re just car insurance experts here to help YOU! This guide will break down Maryland’s policy options, explain why certain types of coverage are important, and translate the jargon that makes your head spin. We want you to get the proper car insurance coverage for the right amount of money, so let’s get started. Maryland is a “fault” state, which means that the driver who caused the collision must assume responsibility for any harmful outcomes. Of course, the at-fault driver’s insurance provider will cover these losses within policy limits, and that’s why liability coverage is required. Liability insurance covers whoever (drivers, passengers, pedestrians) gets hurt in an accident that you — or someone under your policy — cause. It covers their medical bills, property damage costs, and other relevant bills within policy limits. For added protection in the case of a wreck where people and cars are left in critical condition, Marylanders can carry more than liability coverage. To cover your own damage in a car crash situation, collision coverage and uninsured motorist coverage are ideal. Since Maryland requires you to have car insurance, there may be times when you’ll need to prove you have coverage, especially when you get in a car accident or get pulled over for any reason. Therefore, this state requires that you carry an up-to-date insurance identification card with you or in your car. It may be a paper, plastic, or electronic card. All that matters is that it’s current and accurate. Anyone unable to show this card can be fined $50. If your insurance company notifies the Maryland Department of Transportation Motor Vehicle Administration (MDOT MVA) that you’ve canceled your only active insurance policy, you’ll get a “Proof of Insurance Needed” letter in the mail. If this is the case, be sure to obtain a new insurance policy as soon as possible. If, however, there was some mistake and your vehicle is still insured, contact your insurance company and request that they send an eFR-19 form (not an ID card or policy) to the MDOT MVA; this form will be valid for 30 days. In 2014, the annual per capita disposable personal income in Maryland was $46,875. The annual full coverage average of auto insurance premiums for 2014 was $1,096.37. Thus, on average, Maryland’s car insurance payments require about 2.34 percent of your income. Thankfully, when it comes to learning where to find the best car insurance at the lowest price, you’re in good hands with us here at Car Insurance Comparison. Let’s go over the cost of core car insurance coverage. When comparing Maryland to the national annual car insurance average, Maryland costs are higher. The national average is $1,311, while Maryland’s average is $1,590 — the eleventh highest average out of all 50 states. We’ve collected the average premium costs for each core coverage type from 2015. If you’re in Maryland, there’s a chance these costs have already increased by now. The data in the above table comes from the National Association of Insurance Commissioners. In 2015, 12.4 percent of motorists in Maryland didn’t have car insurance. This stat didn’t place Maryland at the top of the list for the highest percentage of uninsured drivers in the United States, but that percentage still isn’t great. As aforementioned, collision coverage and uninsured motorist coverage are advisable additions, and your insurance company may already require them (even if Maryland State does not). Additionally, comprehensive coverage is helpful because it covers any car repairs that have nothing to do with collisions, like in the case of vandalism or natural disasters. Loss ratios gauge the financial status of a car insurance company. Basically, a loss ratio is the money a company pays out for claims…to the money they receive for premiums. So, if they pay $40 in claims out of $100 taken in on premiums, their loss ratio would be 40:100, or 40 percent. The other 60 percent goes to paying overhead. A company that pays more in claims than it collects for premiums has a high loss ratio and isn’t in good financial health, so you want to steer clear of companies in this situation! We know your goal is to get the complete coverage you need at an affordable price. Common misconception: Men pay more for car insurance. In most states that isn’t always true, and Maryland is one of them. In Maryland, both GEICO and Progressive charge females more than males who have the same profile and driving record. This table shows the top five ZIP codes with the highest average rates and the top five ZIP codes with the lowest average rates. If you live where there are higher rates in Maryland, know that you’re not the only one paying a lot of money for car insurance! It’s also helpful to know that rates aren’t just based on where you live. Demographics affect the types of coverage you have. Do you live in Maryland and fit into any of the following descriptions? A family with young drivers pays an annual average of $8,440 for car insurance, compared to a range of $1919 to $2950 for a family with no young drivers. A young single male (age 30) pays almost the exact amount as a single male (age 50): annual averages of $1592 and $1593, respectively. A senior female (age 65) pays an annual average of $1,099 for auto insurance. Now that you have an idea of how auto insurance rates compare between some Maryland ZIP codes and demographics, let’s take a look at the insurance companies licensed in your state to help you find the right company for your coverage needs. With the hundreds of car insurance providers out there today, it’s nearly impossible to know who to trust. You’re probably wondering, “Is it safe to switch to a smaller company that offers lower rates?” Let us help you decide! Keep reading to discover the best providers across the Old Line State. Let’s discuss Maryland auto insurance companies’ financial ratings. Since Maryland is a Mid-Atlantic state, we’ve consulted J.D. Power’s study on car insurance companies with the best customer ratings in this region. 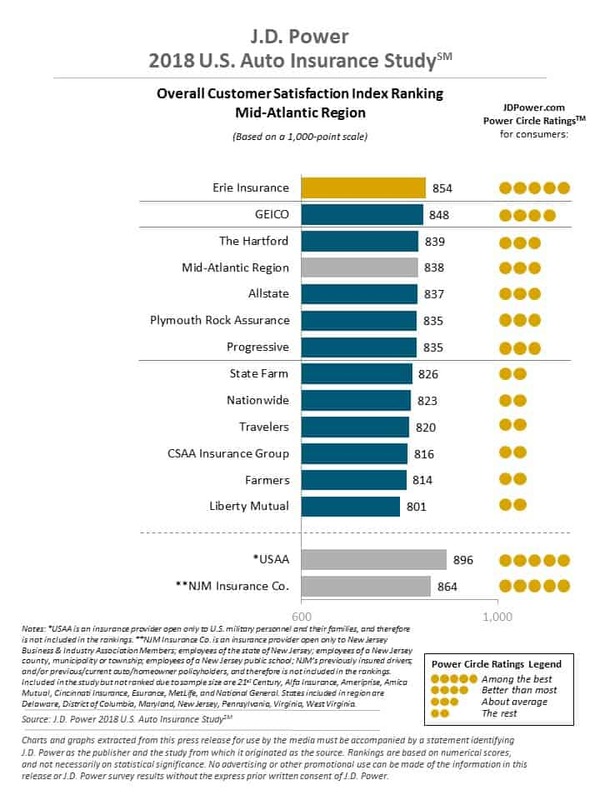 With a score of 854 out of 1,000, Erie Insurance is number one with the best customer ratings in Maryland (and other Mid-Atlantic states). You’ll also notice several other top companies in the 800s, some who fall below average. While you search for the right auto insurance company for you, keep a company’s customer-satisfaction ranking in mind. After all, you could become their customer, too! Since State Farm ranks “below average” in the J.D. Power graphic, it’s no surprise that they received a grand total of 1,482 customer complaints in Maryland in 2017, making them the Maryland car insurance company with the most complaints. The company with the second highest amount of complaints is Government Employees Insurance Company, with a total of 333. That’s a huge drop from State Farm! As a Marylander, it’s wise to keep these numbers in mind. We’ve compiled a list of the top five cheapest companies that serve Maryland — along with the top five most expensive companies you should avoid if you want cheaper car insurance. That way, you don’t have to do all the research yourself! What’s more…we can help you find the cheapest rates around. Following your state car insurance laws is important, but they can be difficult to decipher. Not to worry, though — that’s just another reason why we’re here to help! To keep you informed, we’ll give you an inside look at some of the most important auto insurance laws in Maryland. If you’ve racked up car insurance debt in Maryland, there’s a chance that 80 percent of your penalty fees could be waived. If you break or damage your windshield, your insurer can repair or replace it with aftermarket parts that are similar to the original in type and quality. In preparation for a possible damaged windshield situation, you could go ahead and purchase a separate insurance clause that would require your provider to install original equipment manufacturer parts. You can use any repair shop you want, but you may have to pay the cost difference out-of-pocket. Maryland insurance fraud penalties depend on whether your case is a criminal case, an administrative case, or a civil case. For example, if a person is convicted of criminal insurance fraud, they can get up to five years in prison, a fine of up to $5,000, plus a combined sentence if there are any additional charges. But an administrative penalty could result in a fine of up to $25,000. You can find more legal details in this article here. From January 2018 through June 2018 in Maryland, there were a total of 25 civil insurance fraud cases (not just car insurance fraud). The combined penalty charges were $ 66,450, and the combined restitution payments totaled $ 42,461. From January 2018 through June 2018 in Maryland, there were a total of 12 criminal insurance fraud cases. The combined fines totaled $ 1,642, and the combined restitution payments totaled $ 103,939. Injured? Vehicle damaged? The statute of limitations is three years for both personal injury and property damage claims, so that’s how long you’ll have to file a claim and fight for the money owed to you. Whether you’re an older driver, have a driving teen in your family, or are a new Maryland resident, it’s important to know the licensing laws that apply to your age and circumstances. Every state does things a little differently, so let’s look at Maryland’s licensing laws. Is your teenager close to driving age? Let’s walk you through the requirements and restrictions for teens in Maryland. In Maryland, all drivers, no matter their ages, must renew their licenses every eight years. However, drivers age 40 and older have to complete a vision assessment every time they renew their licenses. Anyone over age 70 getting their license for the first time must prove previous satisfactory driving ability or a certificate of physical fitness from their primary doctor. If ready to renew your license in Maryland, start here. If you’ve just moved to Maryland from another state with an already valid driver’s license, you’ll have 60 days to replace it with a Maryland license — unless you’re a commercial driver, then you’ll only have 30 days. Unless your out-of-state license has been expired for over a year, you won’t need to take a knowledge and skills exam. However, you will need to pass a vision exam either way. To drive safely, you need to drive well, and to do that, you must know Maryland’s road rules. Imagine driving on a road where every driver followed their own set of rules! If you’re traveling at least 10 mph below the speed limit or driving slower than traffic on a Maryland highway, you must move out of the left lane. Remember it like this: Slower cars should keep right, but you should always follow the speed limit either way! The table below shows the max speed limits of different types of Maryland roadways. Note that this table does not include slower-speed residential areas and school zones. In Maryland, seat belts are enforced. People aged 16 and older must wear a seat belt. $50 (not including any possible additional fees) is the maximum base fine for a first offense when breaking a seat belt law. Kids aged 7 and younger and less than 57 inches tall must be in a car seat. $50 (not including any possible additional fees) is the maximum base fine for a first offense when breaking a car seat law. Maryland law gives insurance providers permission not to cover injuries and damages that happen when you drive for a rideshare service like Lyft, Sidecar, or Uber. Thus, you will likely need to purchase a commercial policy to have the right coverage. If you don’t have coverage, you could be personally responsible for any medical bills and damages that occur in the case of an accident. But, you should have adequate insurance coverage anyway! If you get in an accident, you will need to provide rideshare insurance proof. In Maryland, there are currently no deployment or testing laws for automatic vehicles. There are safety laws that deal with driving impaired by drugs/alcohol or driving distracted. Let’s break them down for you. If you’re caught driving impaired with a blood alcohol content (BAC) of 0.08 percent or more, you’ll be charged with driving under the influence (DUI). Maryland has a look-back period of five years, which is the length of time a DUI will remain on someone’s record. In Maryland, there is no law specific to driving while under the influence of marijuana. In Maryland, all drivers are prohibited from handheld cell phone use while driving. Reminder: Drivers under 18 are banned from using their cell phones at all, unless they need to call 911. Texting while driving is also banned for everyone. No matter where you live and drive — Maryland or otherwise — don’t text and drive! Also, be alert while driving and talking on the phone with earbuds in, and keep your eyes on the road! Let’s discuss other important facts and stats about Maryland. We have all the interesting data right here! 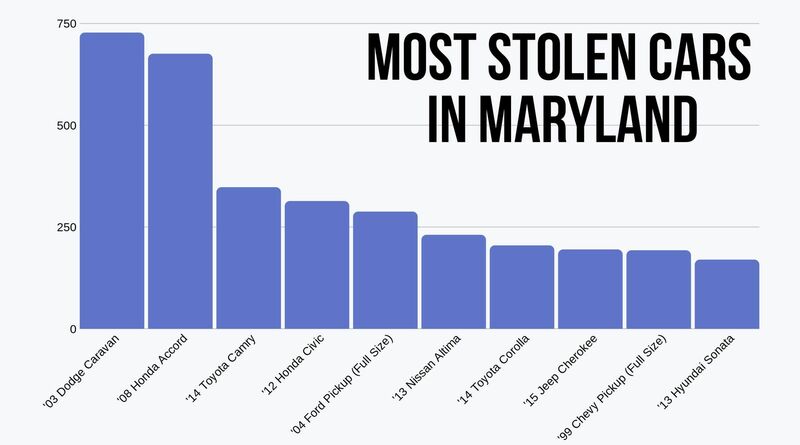 Which vehicles get stolen the most? Let’s take a look. 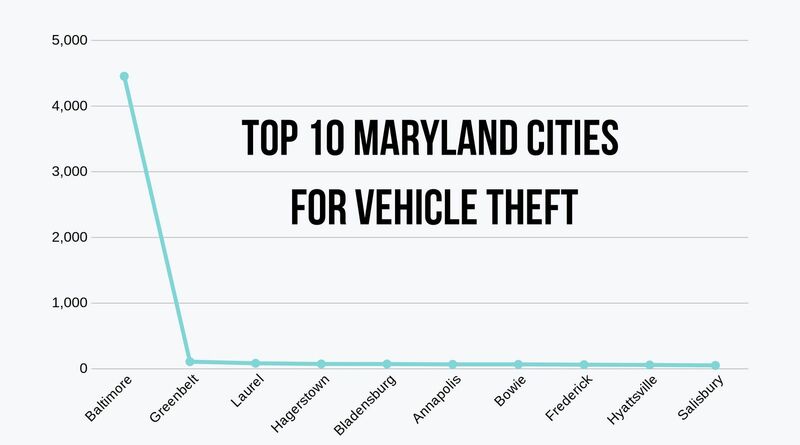 As you can see, there’s a huge disparity between how many cars get stolen in Baltimore City versus all other Maryland cities! If you’re wondering about Maryland fatality rates, check out the following data related to demographics, car accidents with alcohol-impaired drivers, and more. The NHTSA is the source for all of the following fatality data. If you’re severely injured in a car accident, the Emergency Medical Services’ (EMS) response time could make the difference between life and death. Below are the average response times for both urban and rural areas of Maryland. Check out these facts about car ownership, commute time, commuter transportation, and traffic congestion in Maryland. Baltimore City ranks 36th for most traffic congestion — out of all cities in the US. It ranks 42nd out of 319 North American cities and 252nd out of 1,360 cities in the world. The following chart displays how much time commuters spend in traffic in Maryland’s five most congested cities, including Baltimore. Now that you have quality car insurance facts (and beyond) for Maryland, you’re ready to follow the rules of the road, insurance requirements, and more. Don’t forget: If you want to drive as a Maryland resident, you need car insurance! Enter your zip code below to get a free quote comparison.